2,500 years ago the Buddha formed the Sangha community of monks and nuns. Depending on support from the lay community, they studied and meditated in order to teach and spread the Dharma. The founder of the FPMT, Lama Thubten Yeshe, formed the International Mahayana Institute to ensure the continuation of this tradition, by westerners in the West. 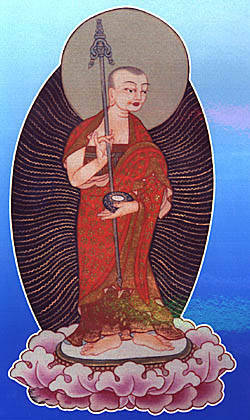 Today, few of us are able to devote all our time to religious practice as members of the Sangha. But it is vital that some do. The Buddha said: "Wherever there is a monk or nun observing the Vinaya, that place is luminous an radiant. I see that place as not empty and I myself abide there peacefully.". Any donation you make contributes to the welfare of the whole of the developing Sangha of the IMI. Your money will help maintain Sangha communities and the studies and retreats of individual monks and nuns. Your support is urgently needed NOW so that the IMI Sangha may live and learn, and teach and spread the Dharma. IMI is a member of the Foundation for the Preservation of the Mahayana Tradition.